I spent a week in Sheffield recently. It is a great city with amazing coffee shops that sell awesomely yummily scrumptious cakes. 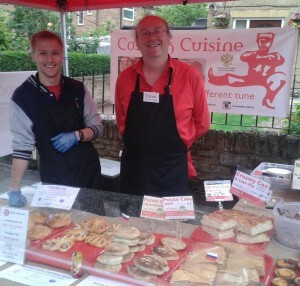 In Netheredge (a part of Sheffield) we discovered an open market with a prize winning pie stall called Cossack Cuisine. It was full of brilliant pies. These two men run the stall. At some stage, they might turn up in a story; they and their stall as stored away for future reference. I had a brilliant day on Friday 10th July. 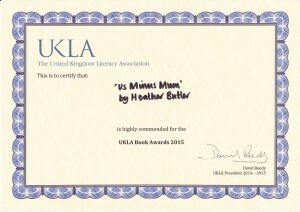 The UK Literacy Association Book Awards were held in Nottingham and Us Minus Mum won the first ever Highly Commended 7-11 Award. How exciting was that and thank you judges – who are all teachers. 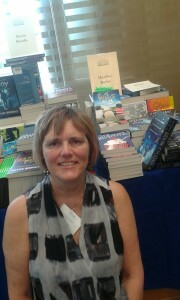 The Award ceremony was part of the UK Literacy Association conference and I met lots of interesting people. To find out more about the awards, click here. 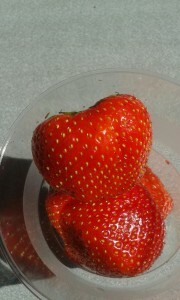 On my way to Nottingham, I was sitting in the train and the stewards handed out free strawberries! 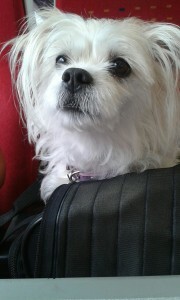 And on my way back I sat opposite a dog that had been rescued from a refuge for homeless canines in China. He was very cute. When I arrived home, I discovered that Little, Brown (my publisher) had sent me a bouquet of flowers to celebrate as well; so I had a very exciting few days. I am so looking forward to my summer holiday! I’m hoping to do some writing, read some books, get up late and go on a diet. We’ve had friends from America staying with us and have been to Stonehenge and Highclere castle and London lots of times and eaten lots of afternoon teas and cake. Oh no! We’re back to cake (and diets)… again.